Spice Treasure Traditional Indian Restaurant uses their own specialised couriers to deliver their food. 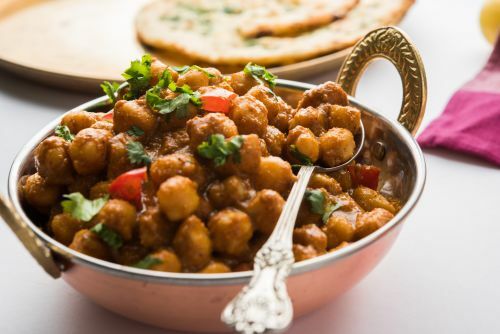 Crisp crackers topped with diced potatoes, chick peas, yoghurt and chutneys. Bombay bhel mixed with spices and chutneys. Potato patties topped with chickpeas, yoghurt and chutneys. Unique chaat preparation with raw peanut, tossed with onion, tomatoes & chutneys. Samosa topped with chickpeas and chutneys. White lentil fritters topped with yogurt and chutneys. Cutlet made from potatoes and vegetables with herbs and spices. Spinach, potato and green peas (patties) tikki with hot and spices. Cottage cheese fried in chickpea batter. Veg. cutlet, paneer pakoda, samosa, potato kachori (half 1 piece each/ full 2 pieces each). Chickpea curry with fried bread. Mushrooms marinated in tandoori paste and cooked in tandoor. Diced cottage cheese marinated in tandoori paste and cooked in tandoor. Paneer pieces marinated in mild white paste of cashew and cream and cooked in tandoor. Full chicken marinated in tandoori paste and cooked in tandoor. Chicken tikka, chicken malai tikka, lamb cutlet, lamb khaas, seekh kabab (half 1 piece each/ full 2 pieces each). Boneless chicken pieces marinated in mild white cream, cashew paste and cooked in tandoor. Boneless chicken pieces marinated in tandoori paste and cooked in tandoor. Chicken drumsticks marinated in herbs and spices then cooked in tandoor. Fish pieces fried in chick pea batter with spices. Prawns marinated in herbs and spices and grilled in tandoor. Mixed vegetables cooked with herbs & spices in thick gravy. Mixed vegetables cooked in a mild onion based gravy. Mixed vegetables cooked in Goan style hot vindaloo sauce. Chick peas cooked in onion, tomato, ginger & garlic based gravy. Cottage cheese cooked with fenugreek leaves with a touch of cream. Mushrooms and peas cooked in onion based gravy. Cottage cheese & spinach puree cooked with mild spices & herbs. Cottage cheese cooked in mild makhani sauce. Tandoori cottage cheese cooked in kadhai gravy. Grated cottage cheese cooked with onion & tomato based gravy. Cottage cheese and green peas cooked in gravy. Paneer cooked in white cream sauce with spices. Paneer cooked in mild onion gravy. Potato balls stuffed with cashew nuts and raisins, cooked in a mild creamy sauce. Paneer cooked in kadai gravy with onion, capsicum & tomatoes. Black lentil cooked in spices, tomato, butter and cream. A specialty of yellow lentils gently cooked with fresh herbs, tomatoes and tempered with onion & garlic. Cashew & cottage cheese cooked in kadhai gravy. Boneless chicken cooked with mild spices, herbs and onion. Chicken cooked in hot and spicy garlic sauce. Cooked tandoori chicken tikka finished in tomato based gravy. Boneless chicken with mustard, curry leaves, chillies and coconut based sauce. Chicken pieces cooked in white cream sauce with spices. A speciality from boneless chicken mildly spices, cashew nuts and cooked in creamy sauce. South Indian spicy chicken cooked with spices & curry leaves. Chicken pieces cooked with fenugreek leaves with a touch of cream. Chicken drumsticks cooked in spicy Kolhapuri style gravy. Pieces of chicken simmered with spinach and fresh gravy. Boneless chicken cooked with hot vindaloo sauce. Chicken cooked with spices in a gravy with egg. Boneless chicken cooked with fresh tomatoes, ginger, capsicum, herbs, spices & gravy served in kadai. Chicken marinated with tandoori spices & tandoori grilled & simmered in enriched tomato based gravy. Boneless chicken pieces cooked in gravy with fresh coriander and ginger. Chicken pieces cooked in chicken mince and spices. Tandoori chicken pieces cooked in thick gravy. Lamb cooked in curry sauce with herbs and spices. Lamb cooked in onion based gravy with tomatoes and capsicum. Diced lamb cooked in mild cashew nut and cream sauce. Lamb cooked with hot vindaloo sauce. Lamb cooked with spinach gravy and spices. Diced lamb cooked in mild butter sauce. Authentic goat meat curry cooked in herbs and spices. Goat cooked with lamb mince in thick gravy, herbs & spices. Spiced fish cooked with onion, tomato & capsicum in gravy. Fish cooked with traditional spices, coconut milk & curry leaves in thick gravy. Prawns cooked with freshly ground herbs and spices, accompanied by flavour of onion gravy and capsicum. Prawns cooked with garlic, tomato and onion based gravy. Boiled eggs cooked in onion and tomato based gravy. Scrambled eggs with onion, tomato & spices. Boiled eggs in onion based gravy with capsicum. Rice stir fried with capsicum, onion, soy sauce, chilly sauce, ginger & garlic. Rice stir-fried with boneless chicken, capsicum, onion, soy sauce & chilly sauce. Batter-coated fried cottage cheese in soya sauce, chilly sauce, onion, capsicum, garlic & ginger. Golden fried vegetable dumplings in a spiced soya sauce, chilly sauce, ginger & garlic. Batter coated chicken with capsicum, onion, soya sauce, chilly sauce, ginger & garlic. Crispy chicken tempered with curry leaves, sauces and spices. Batter coated chicken cooked in hit schezuan sauce. Prawns tossed with rice onion and soy sauce. Rice tempered with cumin seeds & garnished with green coriander. Basmati rice cooked with spices and herbs. Rice cooked with coconut, Mustard seeds and curry leaves. Rice cooked with green peas and spices. Rice cooked with nuts and spices. Rice dish prepared with boiled eggs and spices. Tender chicken pieces gently cooked with rice, tomatoes, whole spices & fresh herbs. Rice cooked with boneless lamb, onion, tomatoes, herbs & spices. Rice cooked with goat pieces, onion, tomatoes, herbs & spices. Chicken tikka cooked with basmati rice, whole spices & herbs. Fish tikka with basmati rice, onion, tomatoes, whole spices & herbs. Wholemeal roti baked in tandoor without butter. Naan bread made from plain flour without butter applied on top. Plain flour bread stuffed with cottage cheese spices and then baked in tandoor. Tasty cheese and green chilly on plain flour bread.